Amplify the AIR OUTPUT from your Register by placing this Top-mount Fan over the top of the register. The TOP-MOUNT FAN will fit over a floor register with a hole opening of either 4 X 10 inches, 4 X 12 inches, or 6 X 12 inches. The Air Flow from your normal register will be enhanced and amplfied and will blow-out much stronger as the fan from the top-mount will boost the air output CFM. It will work, not only with HEAT, but also AIR CONDITIONING. This Top-Mount Fan will pull extra air out of weak registers, boosting the airflow by 80%. It produces an incremental 100 CFM add-on to the existing CFM already coming out of the existing register. It runs on 115 VAC and .35 Amps with a 6 foot cord. The weight of it is 2.25 lbs and a shipping weight of 5 lbs. The COLOR is an Off-White. It costs less than 25 CENTS a day, sounds like a silent swoosh, with a sound rating of 2.2 Sones or 50 dBA. Check out our other Corn Stove items listed in our Ebay Store. There is one Color Option of Off-White. It fits over the top of your register and will boost the CFM by around 100 CFM. It runs on .35 AMPS and 115 VAC and a sound rating of 2.2 Sones or 50 dBA. FAN DOORWAY AIR CIRCULATOR, move air from room to room thru the doorway opening. FAN THRUWALL or THRU-the-WALL, move air from room to room. 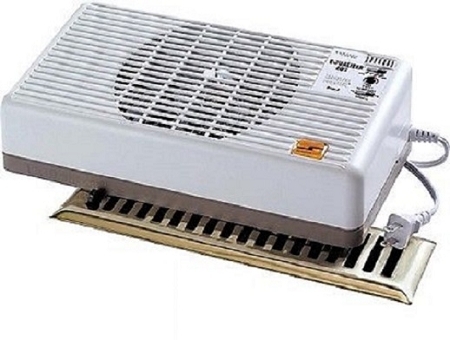 REGISTER GRILL FLOOR CEILING PASS-THRU, mount in your ceiling and floor, allow air to move from floor to floor. Hot air rises, cold air drops. REGISTER FAN TOP MOUNT rests on top of the register and boosts the air output of the register. The WARRANTY on this unit is 1 YEAR or a 12 month limited warranty. Shipping is by either by USPS, Fedex, or UPS, weight with the package included is 5 lbs. Remember to check our Ebay Store for other related items. For questions, comments, or to Buy-It-Now over Ebay contact: Corn Stoves of Iowa, Corn and Wood Pellet Stove Dealer, 1312 1st Avenue, N.W., Cedar Rapids, IA 52405, 319-298-0500, FAX 319-298-0500, E-mail: Use the Ebay Ask-a-question system that is highlighted in blue located at the bottom of the listing in the far lower lefthand side .... .